The first time someone recommended that I listen to Vargnatt, I was rather unimpressed. The Wintergrab demo possessed many unlikable qualities, and I lumped this band in with the likes of Sterbend and Nyktalgia, soon forgetting its existence. Yet some time ago, a friend sent me the track "Traum Von Einer Jugend" from the 2012 E.P. Durch die Stille... As a result of listening to this, I surmised that the band had improved and might be worth another shot. In the end, however, this proved to be too kind of an assumption. 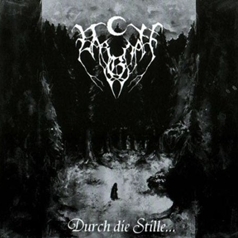 For what it's worth, Durch die Stille... is better than Vargnatt's previous releases. The guy behind this solo project, Evae, dropped the whiny clean spoken bits that soiled earlier recordings, which is a plus. Certain riffs, such as the latter part of "Geist in Ketten", possess a rather disturbing tone and help to create an unsettling feeling. The aforementioned "Traum Von Einer Jugend" is similar in that it gives off a gloomy vibe while also being marked by a sense of urgency. Unfortunately, even the best songs on the E.P. are not free of filler riffs. Vargnatt has the tendency to rely on strangely soft and non-threatening melodies that are uplifting and somewhat optimistic. Some of the songs hint at darkness from time to time, then swiftly retreat from it. The clean guitar bits soften things even further, more reminiscent of Katatonia than of Burzum. As for the track "Erwachen", this sounds like something that belongs on a meditation CD, rather than a Black Metal album. Once again, some one-man "depressive" project turns out to be more calm and relaxing than anything else, similar to the really boring and dull material on the Nur ein Traum demo. The production is rather smooth and on the clear side, almost in a similar manner to Sacramentum's Far Away from the Sun. There is definitely no rough or sharp edge to the guitar tone, here. One might think that a raw sound would benefit this material, but the songwriting itself is so weak that a change in presentation would not save it. While there is a clear Burzum influence, the songwriting betrays an inability to really translate this inspiration into anything worthwhile. Nearly fifty percent of the material on Durch die Stille... is pure waste. The remainder shows some potential, but it is likely that Vargnatt will continue to dwell in mediocrity. For real German Black Metal, stick with Moonblood or Katharsis.